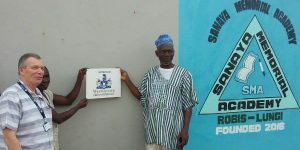 Foundation Trustee Alan Wolstencroft has just returned from a trip to Freetown whilst there he was able to check on the progress at the Sanaya Academy, where the Foundation is supporting the building of a classroom block. Alan also supervised the distribution of a significant quantity of humanitarian aid items that had recently arrived in country having been shipped to the country courtesy of Westminster Group Plc. 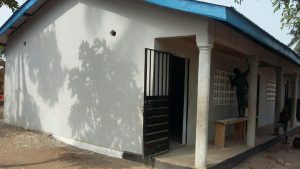 Phase 1 of the project (the building of 2 classrooms) had been completed just prior to his visit , with just a few finishing touches still needed. The school is a junior secondary school with an age range of 10 – 16 previously there were not enough classrooms to cater for all the children on the schools books, it had to run a two shift system basis with the younger children in the morning and the older children attending in the afternoons. Also in each of the classrooms there are about fifty children squeezed in which is not conducive to learning. The school wanted to build an additional 6 classrooms but after discussions with the Foundation it was agreed that initially we would support them to build 2 classrooms and then re-assess the situation. 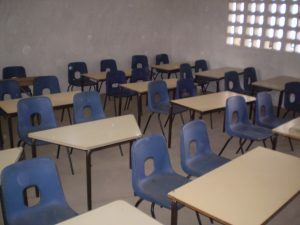 The 3 new classrooms measure 6 metres square and are capable of seating up to 45 students.